I was looking for an easy way to “convert” an XML structure to a normal C# structure and stumbled upon a handy feature of Visual Studio 2013. This also works for any JSON content as well. 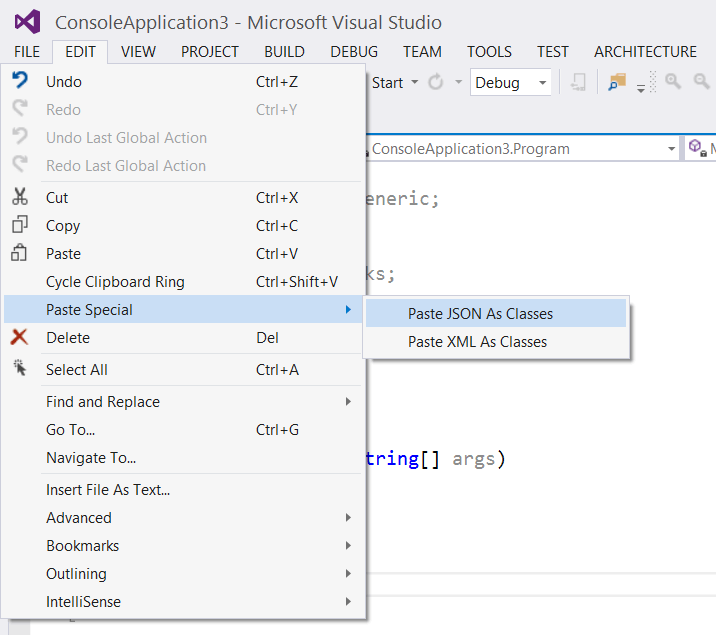 Copy your XML or JSON in the clipboard and make sure you have a .NET 4.5 project selected. I’m not sure why this limitation is in place, but you can use the generated classes in .NET 4.0 and even lower I guess. Then just click Edit - Paste Special - Paste XML/JSON As Classes. The generated classes should work with JSON.NET or any XML Serializer. The Code for the XML is a bit messy, but works and gives you a starting point. Note: There are many other web based XML/JSON to C# converter out there - so feel free to use whatever works for you. I didn’t know this little feature.